Today marked the official store release for the newest MacBook Pro (featuring the Touch Bar). Just a few weeks ago, we were left drooling for its release with our post about the Apple Event. So, naturally, we went to pick up our own MacBook Pro to see if it even lived up to its hype. From the outside, it doesn’t seem all that different. Once you open it, however, the Touch Bar jumps right at you. Check out our 5 main takeaways from just one day with the new MacBook Pro, and what we got from the Touch Bar. It’s as Cool as it Seems. 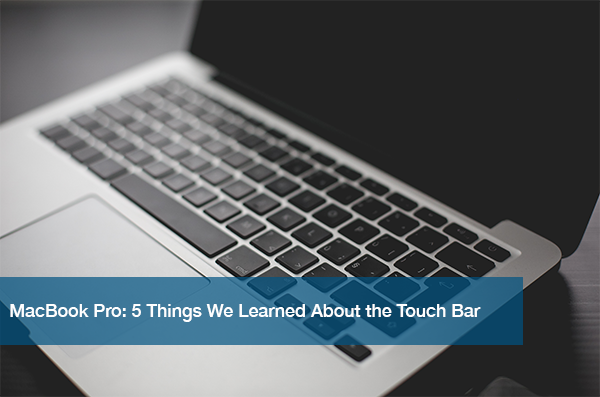 From the moment we turned it on, the Touch Bar had us floored. It adds a little extra shine to your keys, but other than that, it adjusts perfectly into the experience. Before you know it, you forget what life was like without it! Get Ready to Hang Out With Siri More. Whether you use her on your phone or not doesn’t matter. Siri is about to change the way you use the computer. Even the smallest of things become that much easier with voice command. Plus, it easily connects to your other devices and applications to give an even more personable experience. Avoid Bookmarking Your Favorite Online Shops. With the new Apple Pay attachment, shopping for your favorite things just became a whole lot easier. It takes 5 seconds to enter your card information, and then you’re ready to spend with just a tap. Be careful, though- this could also become your worst enemy! No, the Main Screen isn’t a Touch Screen. This may seem like a pretty obvious statement. However, after playing with the Touch Bar for about 10 minutes, you’ll find yourself tapping at the screen itself. Trust us. It’s a little bit of a downside, but at least we have the Touch Bar! The Touch Bar Will Be Your New Best Friend. At the end of the day, we can say that the Touch Bar is awesome. It takes some getting used to, but once you are used to it…you’re hooked! It makes everything just a little bit easier and funner. And who can say no to that? If you can, run to pick up one yourself. The newest from Apple does not disappoint. If you aren’t an Apple person or just want to weigh your options, not a problem. Check out our post The Top 5 Computers to Gift This Season to get insight into what’s on the market today.